Vatharond (VATH-a-rond or VA-taron) is one of the four kingdoms in the Allied Kingdoms of Nora. It is bordered to the west by Tir'Ein and Canstice. To the north by the Green Sea and Vansludera. 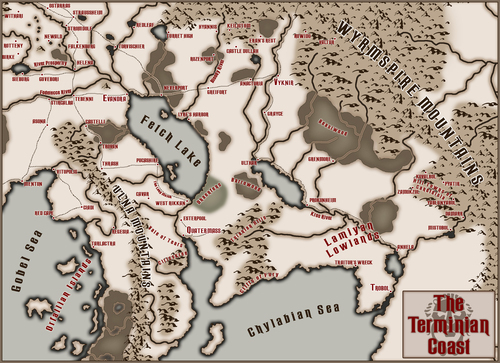 To the south by the Blood Sea and to the east by the Wyrmspire Mountains, the Deadlands and the Soulless Sands. The kingdom's vast history goes back to the Age of Magic. It was formed by an alliance between warring dragontribes with the help of the Holy Skald. Vatharond has the greatest territory of the Allied Kingdoms, but the lowest population. Known for its desolate terrain and hardy people, Vatharond is ruled by King Ioan Alexandru and Queen Anabelle. It is currently engaged in the Severing War against the Noran Alliance in order to gain true independence. The Yfirvegar is a road that goes from Karland to Quatermass, one of the longest roads of Nora. Originally the dragontribes called their territory Fāssia, draconic for Land of Divine Law. When the land began to be settled by Midgardians, they named the land Faðrǫnd, or Father's Breath in giant. The Castle Blood Doom claims most members of House vel'Drakonas in 1358. 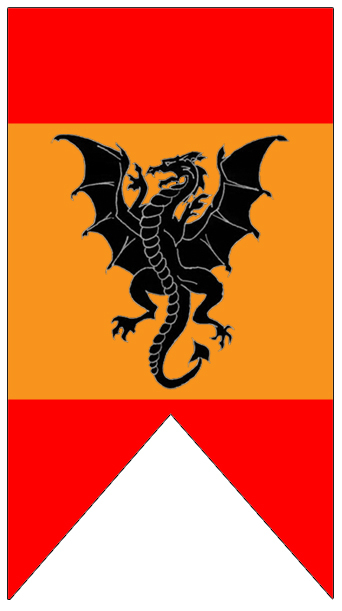 After the death of Bjergen in 1367, the Order of Praavda began to spread into southern Vatharond. The order is not fully defeated until 1376. Leading Noran supplier of coal, steel, iron, magnetite, sunflower oil, wheat, nuts, honey, amethyst, topaz, and emerald. There is a major sub-culture of beekeeping. The soil in Vatharond is considered to be the richest and most fertile in Nora, perhaps in the world. The official alliance between all dragontribes. Tollrand is considered a single duchy, ruled by the Duke of Tollrand. Unlike Ilefain or Canstice, Vatharond does not retain a large standing army. It retains a feudal system of lords and conscripts. The Royal Army of Vatharond is a small military force that serves as a standing army for the kingdom. The army usually numbers around 10,000 fighters. The Vathroni clan or sibbja is a social group based on common descent or on the formal acceptance into the group at a matterstead. A clan is bound by a treaty or oath, not primarily restricted to blood relations. The clan is a cognatic, extended family unit, analogous to the dwarven clans. The average sibbja rarely contains more than 50 families. Gaining most of the traditions of the dragontribes of old, the clan is the primary force of security in Vathroni society as the clansmen are obliged by honor to avenge one another. The Vathroni clan is not tied to a certain territory in the same way as a dwarven clan, where the clanfather owns the territory. The land of the Vathroni clan was owned by the individuals who had close neighbors from other clans. The name of the clan was derived from that of its ancestor, often with the addition of an -ung or -ing ending. As the dragontribes gradually faded from prominence, the concept of the clan lost its relevance for urban commoner. However, rustic farmers, traditionalists as well as royalty and nobility, it remained in use as the name for line and dynasty. Most noble families of southern Vatharond can trace their heritage back to the Blue Dragon Clan. Whereas many houses in the north are varied clans. Notable clans include the royal Blue Dragon Tribe (Blåhemskung), the Red Eagle Clan (Rodorning), Stone Hand Clan, Wastewalker Clan, Ghost Lion Clan, Three Rivers Clan, and the Black Rock Clan (Sortgyngung).